Eric had an unexpected day off on Monday, and it was clear and sunny, so we mowed the yard and trimmed as much as possible. It's still not too bad today, though if it's dry over the weekend I ought to mow again. I think mowing is one of those jobs that will never be done. Before the cut today let's have another dramatic picture of the Plum Stick. Sadly, I moved as I took the picture, so it's a little distorted. But it's still a very cool image, I think. 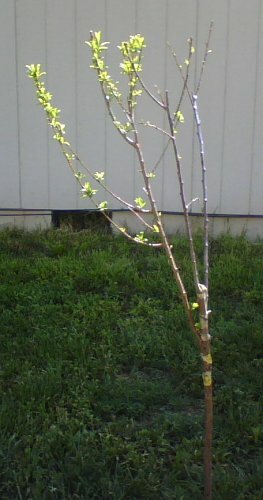 The Plum Stick continues to grow lots of leaves, but it's not doing all that much else at the moment. I keep hoping the branches will get noticeably longer or something. I'm not really seeing it yet. Maybe it's just gradual enough that I can't see it, and once I do some comparing of end of the summer pics with earlier ones I'll see a dramatic change. 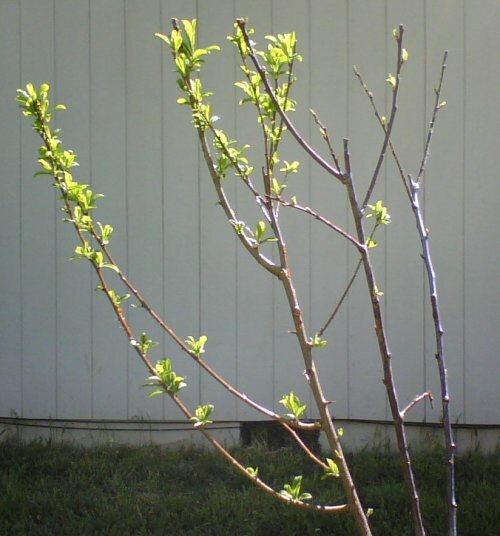 The grafted plum continues to grow more leaves, and now the other branches are starting to display color as well as the big old Santa Rosa one. Looking good, so far! The whole tree still looks sad and only in our back yard, but I'm sure that will change in a few years when it's big enough to provide shade. At the moment, though, the whole place is kind of barren. For a wetsider like me, this whole side of the mountains is barren. Moving inside, let's look at the windowsill to see what's growing there. First up are the Tiny Tim Tomatoes that have been doing just fine. 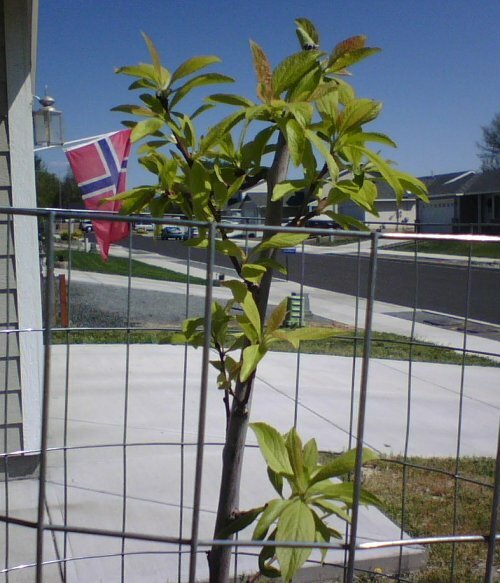 They are getting nicely big, and will be ready to transplant sooner rather than later, I'm sure. 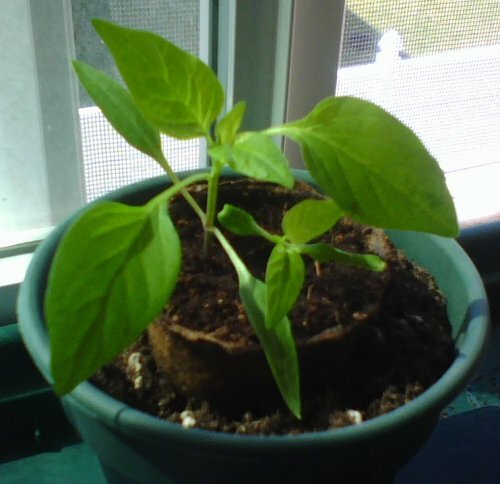 The Yolo Wonder Peppers are needing to be repotted soon, and I might even do that today if I get to it. The way I abuse these poor plants, it's a wonder any of them grow at all, but this place seems to be a place of growth as long as there's just a little water around. 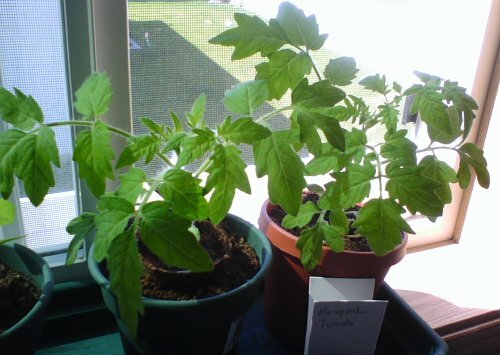 The Moneymaker Tomato Triffids are quickly outgrowing their pots, and will be ready for transplanting extremely soon. I think I'd better plan on taking the one Triffid and one Zucchini to my friend sometime in the next week. The Zucchini plants were starting to argue with each other, so I separated them, one on each end of the windowsill. These really do need to be planted outside within a week or so. I can't really put this off much longer. I have some ideas on just how to do that, but I need to do it soon. 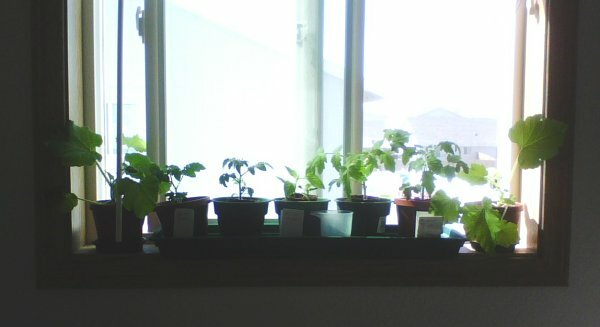 This final image is of all the plants on the windowsill. You can almost see what needs to be replanted outside just looking at it. I think this is likely to be the last image of all the plants together, since a couple will be going to a friend, and I think one will be outside before I next do an update. Tune in next week to see if I actually get around to doing what needs to be done. Will a repot one of the Yolo Wonder Peppers? Will the zucchini get planted outside? Will my friend take the seedlings or run screaming? 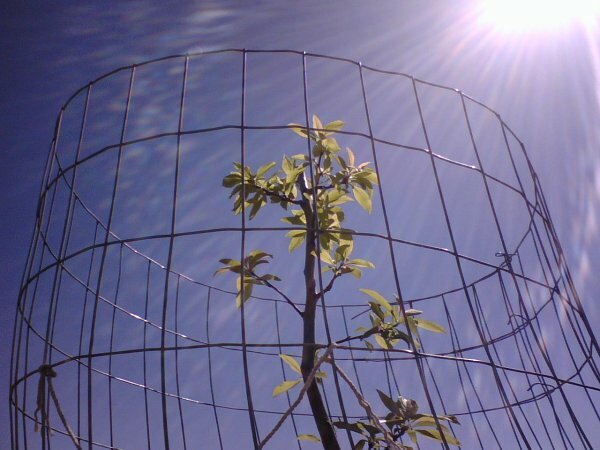 Will the triffids strangle the other plants? Can I keep peppers alive long enough for them to make it outside? Will I win the battle with the neighborhood cats and keep them away from my food plants?